The official, Aleksan Harutyunyan, was unanimously elected by the five-member governing board of the state-run Armenian Public Television and Radio (APTR). The decision was apparently predetermined by Kocharyan who appointed Harutyunyan, 37, and another member of his staff to the board the previous night. "I guess there could not have been another choice of the new chairman," one of the board members, Henrik Hovanissyan, told RFE/RL. He argued that Harutyunyan was a close friend of Naghdalyan and is quite familiar with television. Harutyunyan, for his part, declined a comment. The new state TV chief has long held senior posts in the presidential administration, heading it from 1998-99. Harutyunyan advised the president on foreign policy and local government issues before the latest appointment. He also has reportedly overseen the work of state television in recent years. Despite undergoing a major reorganization in 2001, Armenia's biggest and most accessible television channel has remained under a tight presidential control. APTR strongly supports Kocharyan's plans to win a second term in office in next month's presidential elections and is highly critical of his political opponents. All five members of the APTR board are named by the president. One of them, Ashot Manukian, resigned on Tuesday to give way to another Kocharyan appointee, the 30-year-old Vartan Kopyan. Kopyan was elected deputy chairman of the oversight body the next day. Naghdalyan was shot and fatally wounded as he left his parents' home in the capital Yerevan on December 28. The killing was widely condemned by Armenian politicians and journalists. Kocharyan vowed to "do everything" to bring its perpetrators to justice. However, state prosecutors investigating the shooting have not yet identified any suspects despite brief arrests of several dozen opposition activists on New Year's eve. Some Kocharyan supporters have accused unnamed opposition forces of masterminding the killing, linking it to the approaching presidential elections. The allegations were on Wednesday rebutted by a coalition of 16 opposition parties which said Naghdalyan's death resulted from "the atmosphere of impunity" reigning in Armenia. "The unfolding hysteria already involves threats of a witch hunt and repression of political opponents [of the regime]," they said in a joint statement. The opposition again urged law-enforcement bodies to explore a possible link between the latest high-profile shooting and the October 1999 massacre in the Armenian parliament. Some opposition leaders have argued that Naghdalyan was a major witness in the latter case and was due to testify at the ongoing trial of five parliament gunmen. Harutyunyan's appointment as new TV boss may lead to more such calls. 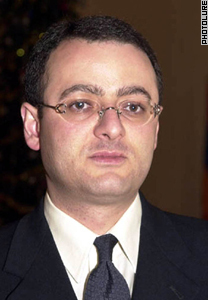 Harutyunyan was arrested in December 1999 on suspicion of complicity in the parliament shootings. He strongly denied the charges and was released for lack of evidence four months later. Some friends and relatives of the attack victims who are in opposition to Kocharyan still suspect him of involvement in the bloodbath that left eight senior officials dead. In a related development, the Council of Europe on Wednesday added its voice to international condemnation of Naghdalyan's killing. "The killing of a leading media personality is not only a crime against that person, but an attack on freedom of the media," the council's secretary general, Walter Schwimmer, said in a statement from Strasbourg. "I call on the competent Armenian authorities to conduct a thorough and transparent investigation in order to bring those responsible to justice."